The THINKlab team are delighted that our project with Network Rail on 4D Simulation Environments for Track Renewal Programmes has been shortlisted for North West Regional Construction Awards 2016 – BIM Project of the year. Design Review Module: To allow teams to collectively explore the emerging designs to avoid any design faults. 4D Simulation Module: To allow the planners to translate 2D schedules into an interactive animation sequence to illustrate deconstruction & construction operations within a given site in 3D. Laser Data Mapper Module: To allow the positioning of laser scanned track data onto a 3D GIS environment and make accurate measurements to support operation and maintenance. The modules have already been used to support four live track renewal programmes including the West Coast Main Line, Watford Junction, Colton Crossover and Wichnor Crossover. It has been a great opportunity for the THINKlab team to apply our modelling and visualisation skills in supporting a complex project such as track renewal programmes. 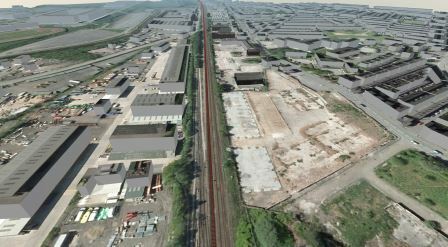 This complex simulation environment has been designed and delivered to the Network Rail team within a short period of time and it has now been used to simulate four sites so far. These modules have replaced the previous planning meetings around a simple whiteboard and now provide an interactive system that allows the teams to navigate the schedules in real time moving between tasks seamlessly in order to brief teams, plan labour, materials and equipment requirements, and to visualise potential scheduling issues. Click here to watch our video demonstrations of the modules.